Big data technologies offer new opportunities for analyzing historical data generated by process plants. The development of new types of operator support systems (OSS) which help the plant operators during operations and in dealing with critical situations is one of these possibilities. 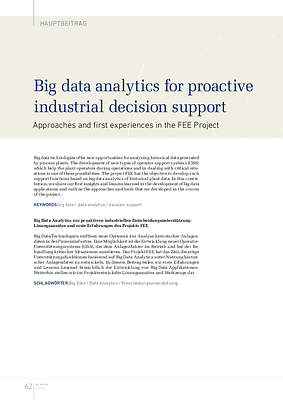 The project FEE has the objective to develop such support functions based on big data analytics of historical plant data. In this contribution, we share our first insights and lessons learned in the development of big data applications and outline the approaches and tools that we developed in the course of the project.